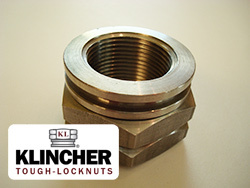 Klincher Locknuts have been popular since the 1940’s when their innovative design was first introduced. The jet aircraft and aerospace industries have relied heavily on custom versions of Klincher Locknuts, and so have various other industries where high vibration, tensile strength, corrosion and temperature are operating factors. Demanding industries and applications such as automotive turbochargers, military applications, various types of turbines, etc. continue to use both standard and custom Build-to-Print versions of Klincher Locknuts, because they are still the best solution. These locknuts have truly stood the test of time! They are still specified by OEM’s and demanded by Design Engineers throughout the world, and we continue to generate new customers for these products. 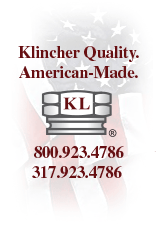 If you have a demanding application where locknuts are required, contact us to see how Klincher Locknuts may be able to meet your challenge.